An impressively powerful phone, but not designed for standard human hands. Brilliant screen; Excellent performance; Extensive multimedia support; Great battery life; Packed with features. Uncomfortable for single-handed use; Feels too plasticky; S-Voice is worse than Siri. Samsung has had two big launches this year — the GALAXY S III (GS3) and the Note II. The latter is literally big, and industry experts have argued hot and hard about acceptable sizes for cellphones. Comfortable or not, phablets have been doing well in the market, which explains why LG and other brands have joined the party. Still, other phablets haven't matched the success of the original Note, which pioneered the phablet category. A year after that launch, Samsung came up with a successor that packs in more power, features, and an even bigger screen. And let's not forget that it's one of the first few handsets that offers Android 4.1 (Jelly Bean) out of the box. So does this biggie live up to expectations? If I have to describe the Note II in one word, it would be "enormous." It's so big that it makes phablets — such as Micromax's Canvas A110 and the Mercury magiQ — look normal. It's undoubtedly the most uncomfortable phone I've used in recent times. All the while that I was testing the device, I was a little afraid that it would slip; it didn't fit comfortably in the pocket of my jeans either. But that's my experience; one of my friends owns a Note II, and he hasn't complained. Despite Google's love for on-screen navigation keys, Samsung has decided to go with its good old physical home button, and two capacitive keys to keep it company. This will make existing GALAXY users feel at home. The Power / Lock button is on the left, so you can easily reach it with your thumb. The volume rocker is on the right, and the stylus slot is at the bottom. Calling the Note II's 5.5" Super AMOLED screen "stunning" would be understating it. I'm totally impressed by the screen's ability to produce deep blacks. I had no problem with legibility in sunlight either. It's protected by Gorilla Glass 2, so you won't be worrying about the screen getting scratched. If I had to get nit-picky here, I'd complain about the bluish tint on the display. At 266 ppi (1280x720 on a 5.5" screen), the Note II's pixel density is lower compared to its predecessor's 285 ppi (1280x800). Still, the display is significantly sharper. This is because of the RGB matrix layout of the latest Note, as opposed to the original Note's PenTile matrix. Weighing in at 180 grams, it's heavy — but I didn't find the weight per se to be an issue. A few additional grams compared to a regular smartphone won't sprain your hand. The retail package is a standard affair: Charger, USB cable, and earphones. Although the device supports MHL and USB-OTG features, these accessories aren't bundled. For a device this expensive, I think the Korean manufacturer could have shown some generosity. 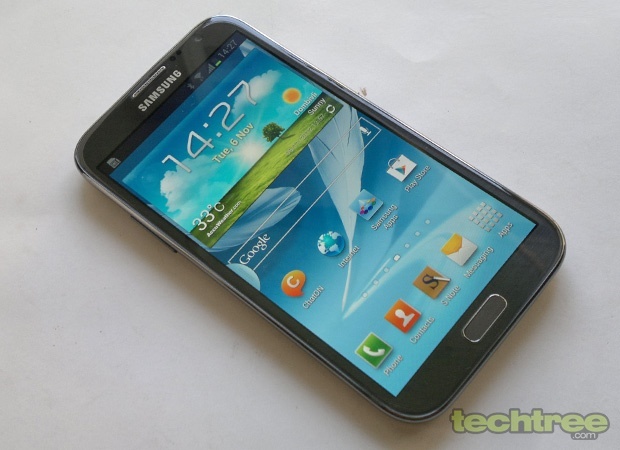 The Samsung Galaxy Note II is powered by the Exynos 4412, with a 1.6 GHz CPU and a Mali 400 GPU. It comes with 2 GB of RAM, and has an 8 mp camera. The detailed list of specs is at the end of this review. 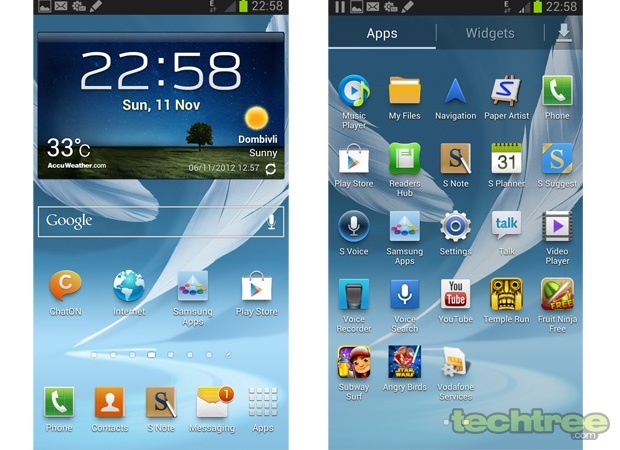 The Note II features Android 4.1 (Jelly Bean) with the TouchWiz UI on top of it. There's been a good effort to make full use of the bigger screen. The notification bar has been enhanced to offer more information. Apart from the Wi-Fi, GPS, and Silent mode toggles, you get a brightness slider right there, which is very handy. Because of the handset's sheer size, though, pulling down a notification bar with single-handed use is an uphill task. 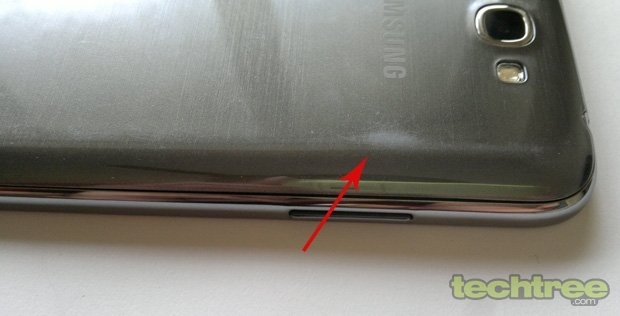 The UI is identical to that of the GS3 — until the stylus comes into action. Take it out of its slot, and you're presented with a homescreen containing the S-Note app. Apart from taking notes, the stylus can be used for quickly launching some select apps. 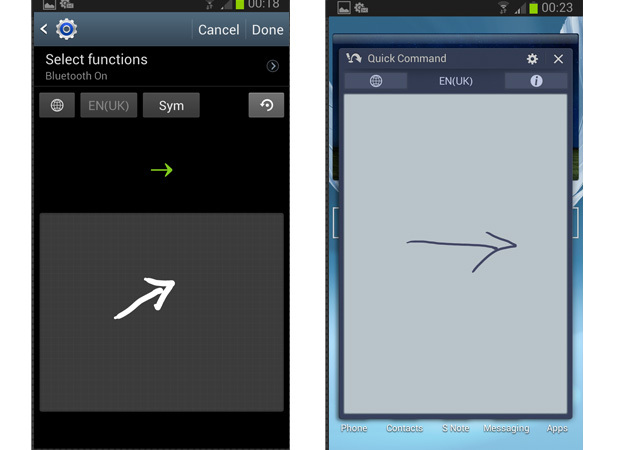 Press and hold the stylus' button and swipe it upwards to start the Quick Commands feature. Draw an arrow to turn on Bluetooth, a question mark to trigger search, or # to bring up the dialler. All this works quite well, but performing such tasks the good old way is faster and more convenient. Another feature worth mentioning — not very useful, but interesting nevertheless — is Air View. Hover the stylus over any folder in the gallery and you see a thumbnail view of what's inside. Similarly, holding it over the inbox reveals text. Split screen multitasking makes good use of the large screen. I was able to have the browser and video player run simultaneously. Thanks to the absurdly powerful quad-core CPU, the phablet showed no sign of lag or stutter. If you care about synthetic benchmarks, the handset scored 13586 in AnTuTu. Apps supported by this feature include the default email client, browser, gallery, maps, and video player. This isn't functionality that you need from a cellphone, but it's something that you'd want! It's the most exciting UI element I've seen in recent times. With the SG3, Samsung introduced the Smart Stay feature, which uses the front-facing camera to sense your presence (and ensure that the display doesn't dim while you're reading an ebook). This time around, we get the Smart rotation feature: It adjusts the screen rotation according to the position of your eyes. Since the front camera is utilised for tracking your eyes, it doesn't work in low light. 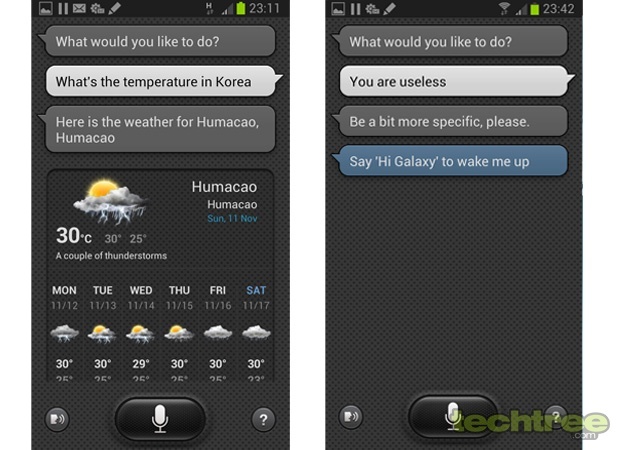 To rival Apple's Siri, Samsung has developed its very own voice-assistant called S-Voice. A nice addition here is that you can write your query using the stylus. This is useful in noisy environments. For some reason, I found S-Voice responding slower compared to Siri (both tested on the same connection). It's worse than Siri at catching words. Even when it gets it right, the software has a knack of throwing irrelevant answers at you. Check out the screenshot below to see what I mean. 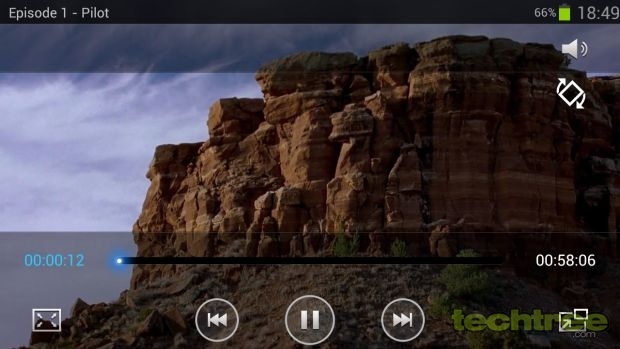 The music player interface is similar to what we've seen on the GS3. The bundled IEMs are good. More importantly, the device's sound quality is great. Samsung has offered plenty of equaliser settings and sound enhancements to experiment with. When it comes to video playback, the Note 2 outperforms everything else in the market. I tested AVI, MP4, MKV, and WMV files up to 1080p, and it didn't stutter at all. Thanks to the 5.5" AMOLED screen, it's simply the best handset a movie buff can have. The 8 MP camera supports many modes, including Burst shot, Panorama, and HDR. You can control contrast, exposure, and apply various filters. Images are sharp and detailed. The snapper is just as good as the one on the GS3. That said, it's quite uncomfortable to take photographs with a 5.5" phablet! Much like the GS3, this handset can record full HD video and capture images simultaneously. Videos are saved in MP4 format, and you get smooth playback at 30 fps. The Note II's phonebook is a standard TouchWiz affair: Swiping a contact to the left results in composing a message, while swiping it to the right lets you call the person. Over a week of testing, I found the network reception and call quality to be excellent. Because the screen is so large, you are unlikely to hit a wrong key. You can also write a message using the stylus. This may sound too gimmicky, but handwriting recognition works very well on this phone. The Note II has quite a large battery: A 3100 mAh Li-ion. In our 720p video loop test with brightness set to 60%, it lasted a little over 11 hours. Considering that the device has a 5.5" screen, this is very impressive. For Rs 36,000, the Note II offers the one of the best and biggest screens in the smartphone market. The multimedia performance is spotless. The well implemented stylus adds value to the package. So should you buy it or not? Well, this is one of those products that you either love or hate. Personally, I wouldn't buy a mobile that's not operable with one hand. However, if you're sold on the idea of large-screen phones, the Note II is the best you'll get. 5.5" Super AMOLED screen with pixel dimensions of 720x1280 (267 ppi). 8 mp auto focus camera with LED flash, 1.9 mp front camera. Dual channel Wi-Fi (2.4 & 5 GHz) with MHL support, Bluetooth 4.0 LE, NFC, Assisted GLONASS GPS, USB 2.0 Host (supports external devices), 3.5 mm jack. 16 GB / 32 GB / 64 GB internal storage, 64 GB microSD card slot. S Pen (stylus) with handwriting recognition support. Accelerometer, Digital compass, Proximity sensor, Gyroscope, Barometer. 3.2" (l) x 6" (w) x 0.4" (9.4 mm) (d), 180 grams.